Landmark decision concerning copyrights and U.S. embargo regulations. Published opinion by 9th Circuit. Favorable jury verdict against Rexall represented by Greenberg Traurig. Disputed amount exceeded $250 million dollars. Favorable settlement against Seccion Amarilla represented by Mayer Brown in a case concerning copyright and antitrust matters. Favorable judgment in excess of $900,000 concerning breach of clinical research agreement. Prevailed at trial in defense of claim exceeding $2.5 million dollars in a landlord/tenant matter. Tan Tee Tan v. U.S. Bank, et al. Successfully represented two co-defendants (J&J Seafoods, Inc.),in a two-phase trial, against a claim of conversion and punitive damages in a jury trial, which resulted in dismissal of both defendants . Succeeded against Plaintiff's Preliminary Injunction concerning trademark infringement which resulted in a published opinion. Successfully represented defendant concerning trademark infringement and antitrust matters in a jury trial, which resulted in full dismissal of the defendant and invalidation of the asserted trademarks (Reg. 291700 & Reg. 3337669). Successfully represented defendant in a preliminary injuction action regarding sale of corporate stock. WRI Golden State LLC v. Hoi Vo et al. Successfully defeating plaintiff's request for order of issuance of writ of attachment and obtaining a favorable result in the settlement for a breach of contract lease in the Superior Court of California Santa Clara County. Dixon Gas Club LLC v. Safeway et al. Successfully obtaining a preliminary injunction order against defendant Safeway in an anti-competition lawsuit in the Superior Court of California Alameda County. Successfully represented defendant in defeating a trademark infringement preliminary injunction in the U.S. Central District Court of California. Qi v. Lu et al. Successfully represented defendants in a breach of contract action and obtained a judgment in excess of $200,000 against plaintiff in Superior Court of California Orange County. Successfully represented defendants in Eastern District of Wisconsin regarding allegations of infringement of four utility patents resulting amicable resolution to the matter. Successfully obtained judgment in excess of $1.3 million against defendants in a judge trial for various causes of action concerning breach of contract. We are counselors, strategists, and advocates for companies and individuals seeking to maximize their interests through various business transactions. We represent US and international clients and emerging companies in intellectual property, real estate, distributorship agreements, and other corporate matters. InHouse Co. is able to protect and maximize your interests in guiding your company beginning with its initial idea through funding and beyond. InHouse Co. attorneys have experience in litigation with a proven track record of success in judge and jury trials and when necessary appeals. We concentrate on commercial litigation including: IP enforcement, business disputes, fraud, breach of contract, complex family law matters and real estate transactions. The team of attorneys at InHouse Co has substantial expertise in obtaining accelerated, preliminary relief pertaining to commercial litigation. Often an early victory can be decisive in determining the outcome of the litigation. Specifically, we have a long track record of handling civil disputes. Coupled with our in-depth knowledge of litigation tactics, our team reacts quickly in a crisis and is able to quickly formulate case strategies to achieve ultimate success. Our team brings a substantial depth of expertise to the practice whether the case is in State Court, Federal Court or even Appellate Court. Moreover, we have represented clients in litigation situated in various states, including California, Texas, Florida, Maryland, Wisconsin, Utah, and Montana. Our clients include individuals, partnerships, and small and large businesses in the United States and Asia. We concentrate on developing an IP portfolio that includes a multitude of patents to provide greater protection of the IP by not putting all of your invention eggs in one basket. In order to increase the chances of obtaining a patent, InHouse Co. conducts a comprehensive search of existing patents. On occasion we advise emerging companies on how to build investment value and an IP portfolio fortress. InHouse Co. attorneys help estates of all sizes in developing and implementing a comprehensive estate plan. We understand the importance of an estate plan and are able to effectively guide any family through a successful estate plan. Jump to the Estate Planning Section to learn more. InHouse Co. attorneys successfully represent buyers, sellers, property owners, investors, developers, landlords, tenants in real estate litigation and transactions. InHouse Co. Law Firm has substantial experience in various aspects of real estate law, as it has successfully represented its clients in a wide range of matters which included Landlord/Tenant Disputes, Breach of Lease, Boundary Disputes, Easement Disputes, Workouts and Foreclosure, Judicial Foreclosure, Real Estate Broker/Agent Liability, Real Estate Transactions, Commercial Office and Retail Leasing and Property Acquisitions/Dispositions Jump to the Real Estate Law Section to learn more. Our attorneys are experienced and success with representing and defending employers with regard to allegations as to 1099 v. W2 mis-classification, disability discrimination, sexual harassment, overtime and meal breaks compensation, FEHA California Fair Employment and Housing Act. We also have wide array of experience assisting employers matters concerning EDD audit and labor commissioner hearings. Our attorneys have vast experience in representing non-US based corporate clients, investors and highly trained professionals. 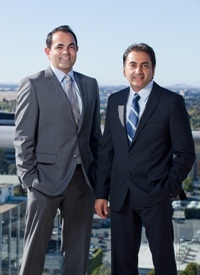 Given our acumen in international business transaction, real estate transaction, corporate business transaction and US Security law, our firm is uniquely positioned to serve investment immigrants from abroad or US based development projects seeking foreign immigrant investments. Whether the requirements are L-1, EB5, EB1, H1B or regional center qualification, we are ready to serve you to achieve the best results possible.